This guide explores all 38 Nutripuncture remedies, explaining what meridians they interact with and what physical, emotional, and psychological symptoms they can help--from treatment of acute illnesses, allergies, and chronic conditions such as acne or osteoporosis to broader goals of surviving divorce, detoxifying from damaged relationships with parents and partners, or reactivating stalled phases of development from childhood or adolescence. 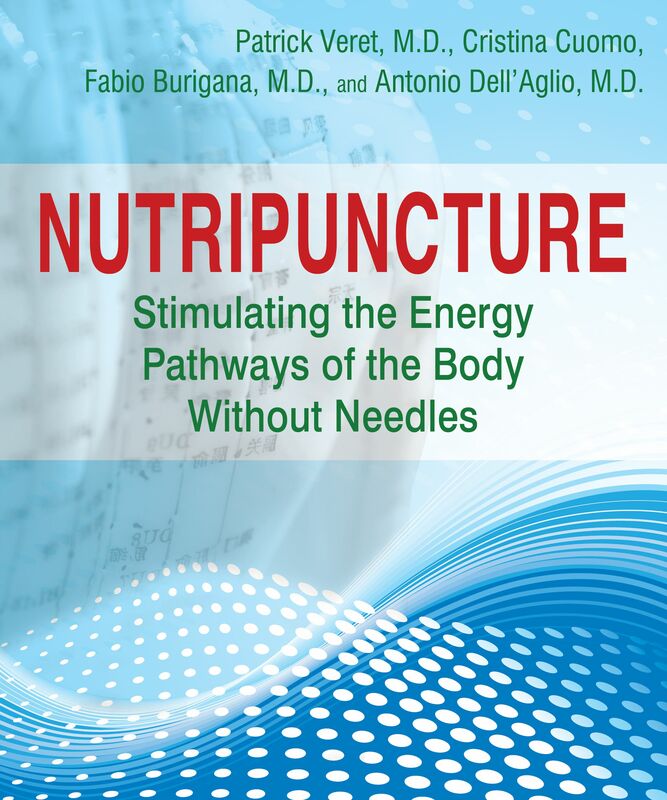 Providing an accessible introduction to this revolutionary method developed by Dr. Patrick Veret, this book shows how Nutripuncture provides an easy and noninvasive way to release unresolved emotional and psychological trauma and support the vital energy of our cells, meridians, organs, and nervous system without negative side effects or drug interactions. A new approach enabling the management of one’s vital potential in a simple and primal way, Nutripuncture finds itself at the crossroads of thousands of years of knowledge from traditional Chinese medicine philosophy, which underlines the interaction between organism and environment, and of Western scientific knowledge, referenced in most recent biomedical discoveries. Nutripuncture activates self-regulation, the body’s own innate ability to optimally interact with its environment (changes of season, stresses in life, relationship conflicts, etc.). This is how, when balanced vital currents nourish the body, the individual can better manage his emotions and achieve his or her sensory, creative, and cognitive potential. Unfortunately, no matter how deeply we wish to and no matter how enthusiastically we try, it is not always possible to use our body’s potential to our best advantage. It is often held hostage by an inexperienced driver (us!). Despite the fact that we have at our disposal an organism that is among the most sophisticated nature has crafted over millions of years of evolution, we do not always know how to “drive” it appropriately, having misplaced the instructions. Today we know that we use only a minuscule part of our potential, probably because we are unaware of the elements governing the amazing complexity of organic life. Nutripuncture stimulates cellular vitality and allows the body to regulate itself, calling on its capacities for regeneration. When circulation of the meridians is encouraged, the body is provided new impulses that reduce the impact of stress and neutralize the information that has weakened our vital currents. For this purpose, Nutripuncture uses 38 mineral complexes (Nutri 01, Nutri 02, Nutri 03, and so on) that stimulate the balance of the vital currents via the meridian lines, where the “impulses” necessary for the organism’s dynamics circulate. It has long been known that minerals and trace elements are essential to cellular life. In the 1980s, thanks to experiments at the University of Orsay in Paris, researchers discovered that by combining each mineral in a specific sequence the patterns created by these Nutris give life to a language, an alphabet, that the organism (body) recognizes and answers to in a coherent way. Nutripuncture uses 14 primary meridian lines and 19 secondary lines (33 meridian lines in total) in connection with the 5 senses and the 5 elements (Earth, Water, Air, Fire, and Ether). The electromagnetic circuits of communication, connecting various organs among themselves, are composed of a succession of points located by measuring musculocutaneous resistance. They outline vital tension lines, corresponding to the morphogenetic currents set up since embryogenesis. In acupuncture the meridian line is named according to the length of its pathway, its localization, and polarity (yin or yang). In the West it is named according to one of its functions: thus the meridian line Shou Yang Ming, which circulates on the level of the upper limbs, is called Colon/Large Intestine. However, its action is not limited to the function of this organ but includes those of the various points it crosses on its way, similar to the famous Route 66 that crosses the United States from Chicago to Santa Monica, California. Yes, this highway does go to California, but it crosses through other states and cities and communicates with them as well. To avoid any confusion, each meridian line in Nutripuncture is labeled by a number, from 01 to 38. Associative Nutripuncture regulates the meridian lines, particularly in response to an occasional stress, momentary disturbance, or seasonal change. It makes it possible to regain better balance quickly. One initially uses the General Cellular Nutritional Regulator (Yin and Yang) remedy, with which one combines several Nutris according to the meridian lines showing excesses or deficiency of energy. For example, the regulation of the meridian lines 22 of the Kidneys (Zu Shao Yin) and 31 of the Bladder (Zu Shao Yin), associated with the General Cellular Nutritional Regulator (Yin and Yang), are indicated each winter to reinforce these circuits, which are particularly sensitive during this season. It is also therapeutic in the event of timidity, fear, or lack of assurance, which are all emotions related to those organs. This first approach is simple and within anyone’s reach; it reinforces overall well-being and “nourishes” the terrain in which certain disorders can surface if left unchecked. Sequential Nutripuncture involves the simultaneous regulation of 5 meridian lines (without using the General Cellular Nutritional Regulator), combined according to a precise order (sequence), conveying specific information according to the mapped circuit in question. Indeed, each sequence is like a sentence made up of 5 words, which, according to their place, expresses different information. The sequence makes it possible to regulate each meridian line, each organ, and enhance each function and dynamic by respecting its uniqueness and incorporating it in the organism’s unit. You can use both Associative and Sequential Nutripuncture in the same day. However, it is recommended to let a period of at least two hours elapse between the times you take the remedies. Research in Nutripuncture has produced an impressive portfolio of sequences, which have been adapted to the “language of the body” and confirmed by experiments. react to a given event is completely personal. Fabio Burigana, M.D., is a gastroenterologist and homeopath. He lives in Italy. Antonio Dell’Aglio, M.D., is a medical doctor specializing in natural medicine and biological dentistry. He lives in Italy.